From a distance the wallpaper looks like a series of imprecise rectangular clusters separated by irregular terracotta coloured strips. As I got closer, however, the imprecise clusters became tiny faces and bodies held tightly together by a labyrinth of fences and walls. 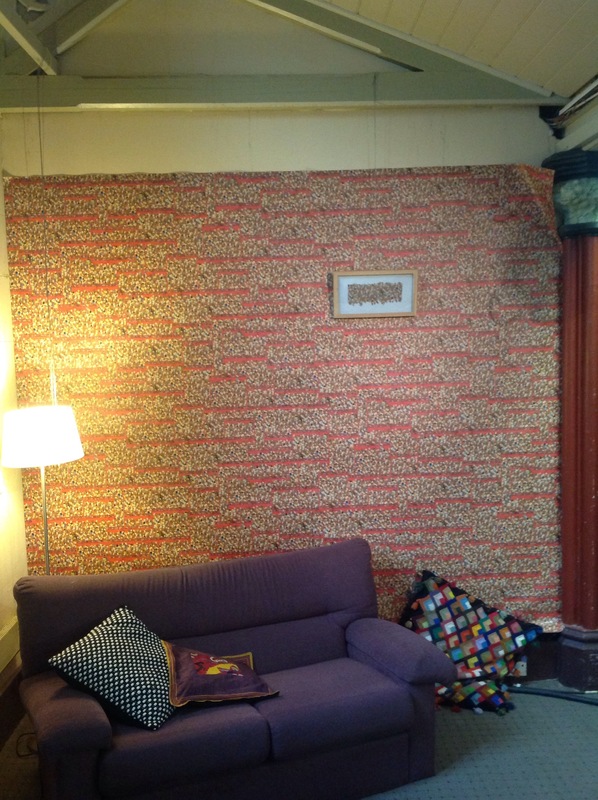 The wallpaper sits behind, yet is framed by, domestic items of a lamp, couch and cushions. 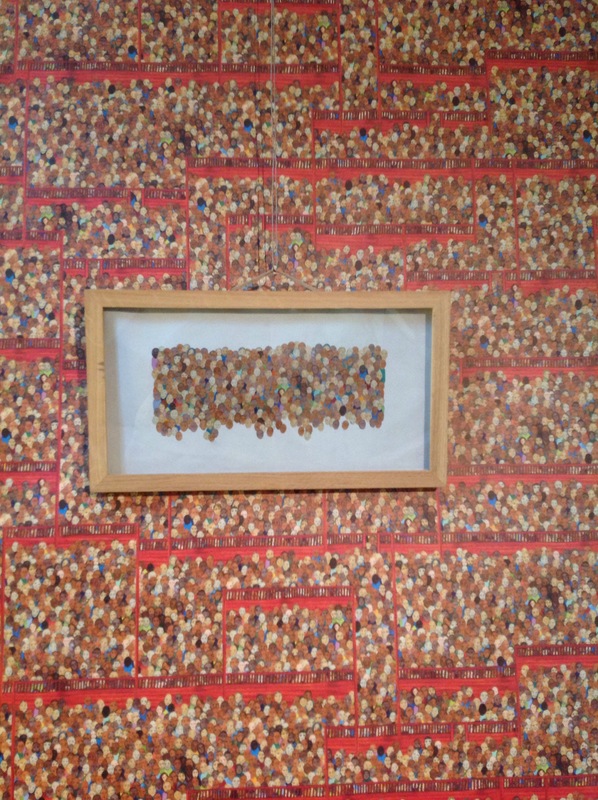 Reflecting on themes of asylum and the temporality of life, Fraser says that this ‘settled setting juxtaposes with the restless, relentless backdrop’ of human faces in holding cells. This is pertinent in Australia where we are told that our borders, our way of life and our homely comforts must be protected. Yet, in the background of these domestic comforts are the faces of those whose lives’ are disposable victims of crimes committed by unidentifiable perpetrators, or at least perpetrators are unwilling to accept they are complicit. Fraser’s work reminded me of Ursula Le Guin’s short-story – The Ones Who Walk Away from Omelas. Le Guin describes an idyllic town, Omelas, where there is peace and the citizens experience unbelievable happiness. Yet, the peaceful and harmonious existence of the citizens of Omelas comes at a cost. Not to them, but to a child kept in a dark cellar under the town. The child is unloved, naked and unfed. A kind word can never be spoken to the child. That is the bargain that makes Omelas such a pleasant town for the citizens. they all understand that their happiness, the beauty of their city, the tenderness of their friendships, the health of their children, the wisdom of their scholars, the skill of their makers, even the abundance of their harvest and the kindly weathers of their skies, depend wholly on this child’s abominable misery. Like the child under Omelas, a mass of human beings live miserable lives while we experience peace and stability and the occasional #firstworldproblem. This is the bargain of the sweat-shop, the bargain of fossil fuel exports, the bargain of de-radicalization laws targeting racial and religious minorities, and the bargain of free trade policies that are freer for some and than for others. This is the violence hidden in the background that makes our normal life run smoothly and peacefully. It is significant that this work is hung on the wall of Newtown Mission, a 150+ year old Methodist Church. This location heightens the moral, political and historical tension of the work. The Church in Australia has been a beneficiary of colonial violence that dispossessed Indigenous peoples of their lands and their culture. It has enabled that violence to be hidden in the background as an unfortunate part of a wider moral project of “civilizing” and “Christianizing”. Yet unlike the utilitarian calculus of pleasure for many and pain for some that determines the bargain set by the citizens of Omelas, aspects of the Church have sought a counter-history that identifies with those who Jesus called the “least of these“. That is, those who the powers of the day discard as disposable waste, yet are described by Jesus as possessing a value that is more than the wealth of the world can afford. Those of us in Omelas, Australia, or wherever must reconsider our own material interests of domestic peace in the foreground and become aware not only of the wallpaper in the background, but the floor boards that hide the stolen land under our feet. Sitting on the couch next to Fraser’s work is discomforting and unsettling. As it should be. *The exhibition is being held at Newtown Mission (king St, opposite the Dendy Theatre) from 1 – 8th November.